The E Visa for Cambodia should be applied prior to the travel date. There are many travelers who apply for the same on arrival and face problems, such as- pay more than what is require, waste their time standing in queues at the airport immigration and more. If a traveler is looking to travel to a different country via Cambodia, then he /she need to apply for two E visas on their passport. There are also a few limitations which come along with the Cambodia Evisa. There are fixed entry and exit points and it is only at these points one can use the Cambodia Evisa to enter the country. For example if you are entering into Cambodia via the Airports, you can only use the Phnom Penh and Siem Reap International airports to enter into the country if you hold a Cambodia EVisa. While, you cannot enter the country if you are landing at the Preah Sihanouk International Airport or Sihanoukville Airports, however you can only exit the country via these airports. Photograph should not wear sunglasses or hats. According to the guidelines issued by the Ministry of Foreign Affairs & International Co-operation Kingdom of Cambodia, every traveler visiting Cambodia from April 2006 for tourism or transit purpose has to apply for a valid E Visa. This E Visa when once issued is valid for the period of 3 months and allows the traveler to stay inside Cambodia territory for 30 days, from the date of entry. 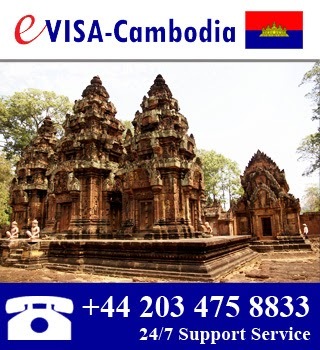 You can apply for the visa with any online Cambodia E visa provider, who will charge you with some processing fees. 1. The traveler should have a passport validity of 6 months at the time of entry. 2. A recent passport size photograph in digital format (JPEG/PNG). 3. A valid credit card (Visa/Master). If the children are travelling on their parent’s passport, then they don’t require a visa to enter the Cambodia territory. Whereas, children above 12 years of age require an E Visa, even if they are travelling on their parent’s passport. People who are planning to travel Cambodia for tourism purpose may apply for their Tourist visa online. To apply for Business Visa, K- Visa & Diplomatic Visa and for any information related to these visas you need to contact nearest Cambodian Embassy. The world has become electronic and so has Cambodia. The Ministry of Foreign Affairs and International Cooperation launched the Cambodia e-Visa program that enables visitors to apply for a Cambodia travel visa online. This simplifies the process of getting a tourist visa for Cambodia. No waiting in long queues, nor the hassle of arranging the bunch of documents. It’s all electronic, one can apply for a visa online by filling up a simple form and making the payment online, That’s it! and you’re done. You will get the visa with the status in your email in a couple of days. Most of the nationalities can get a one-month visa upon arrival at the Phnom Penh and Siem Reap airports, and also at land borders entry points. It is advisable to arrange an e-visa for Cambodia beforehand to prevent potential overcharging at some land crossings, as travelers are sometimes overcharged when crossing at land borders with Thailand, As, at these entry points the immigration officials demand payment in baht and round up the figure significantly. Arranging a visa in advance avoids this potential problem. Copyright © 2013 evisa-cambodia-kh.org - All Rights Reserved.